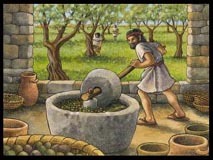 Photos/Renderings of an Authentic Ancient Olive Crushing Vat and Olive press at Capernaum, Israel. 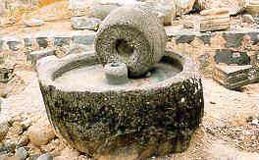 For thousands of years throughout Israel, vats and presses were in operation, as olive oil was a very valuable commodity. In fact, it was deemed every bit as important as the petroleum industry as we know it today. 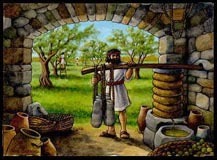 Copyright © 2000 RODCO Ltd.
After 5,000 years, basic methods in the extraction of oils respective to Olive trees, Frankincense trees, and Myrrh trees are still practiced. Over the centuries, techniques have been employed and improved upon for greater yield. These wonderful, high quality genuine ingredients are used in the production of our exclusive, world renowned anointing oils. Straw/wicker baskets pierced with holes on the sides for drainage were filled with pulp from the crushing vat then stacked on an olive press. The baskets were topped with flat stones. 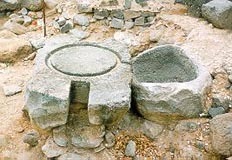 As pressure was applied to the top stone by means of a lever/beam device weighted with larger stones weighing hundreds of pounds, oil was squeezed from the pulp and would be forced to the sides & through the holes in the baskets - draining down to the shallow trough & into a collection vat/basin, ultimately filling it. The oil was then dipped and poured into containers for transport, via camel caravans.